Chances are you’ll be able to read this entire post because I’ve kept it under 500 words and written it as a listicle. If you get called away to stop a potential disaster, you can jump back in at the next bullet point. I know my audience. We are distracted, pulled in many directions, and looking for tips we can apply immediately to our lives. We are tired–so very tired–and feeling guilty. We’ll delve into more of those common denominators later, but let’s start with distracted. It can be a battle to accomplish multi-step tasks or those requiring higher level thinking. Whether working outside of the home or within, the struggle to focus on a task or follow a thought to completion is real. When there are a minimum of eight thoughts flying around your head at any given time, how do you determine that which is most important and furthermore complete the task you’ve deemed vital? Take a few minutes to write out what you would like to accomplish the next day to bring order to the chaos. You may have a wish list of things you need to get done this week, but from that list, identify the things you need to do the following day. Creating this manageable to-do list the night before will help you to visualize when and how those tasks fit into your day. Think about productivity like a stove. If you try to boil water over low heat on a small burner, it will take much longer than using a large burner with high heat. Identify the times and places that you are most productive and try to complete tasks that require more focus during these times. I write in my office in the mornings when the coffee is still coursing through my veins. Sitting on the couch in the evening with the TV on is not where I am most productive. Limit the internal dialogue in your mind. If you’re writing your to-do list and you remember you need to buy groceries and finalize your weekly sales meeting agenda, write these down and then circle back later to make your grocery list and look over the agenda. Following the tangents that occur from intentional thoughts can lead to being easily sidetracked and not fully fleshing out your ideas. If you’re worried about forgetting, make a quick note, but don’t devote mental energy to the things that pop up. Focus on one task. You might have a difficult time imagining what this even looks like. If you are sitting down to write an email, write the email. Don’t bounce back and forth between your inbox and text messages and your web browser. You might be surprised to find that doing one thing at a time and then moving onto the next task is surprisingly efficient. What about when you are going to hang up your coat and see the magazines that need to be recycled, the shoes that need to be put by the door, and the empty cup that goes in the dishwasher? Put away your coat and then circle back. Don’t let the distractions keep you from what you initially set out to do. 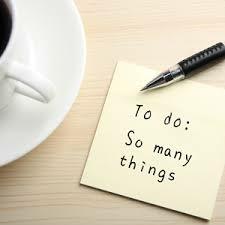 Having your to-do list can help keep you focused on what you’ve identified as actually being important, but it’s up to you to keep those goals in sight.